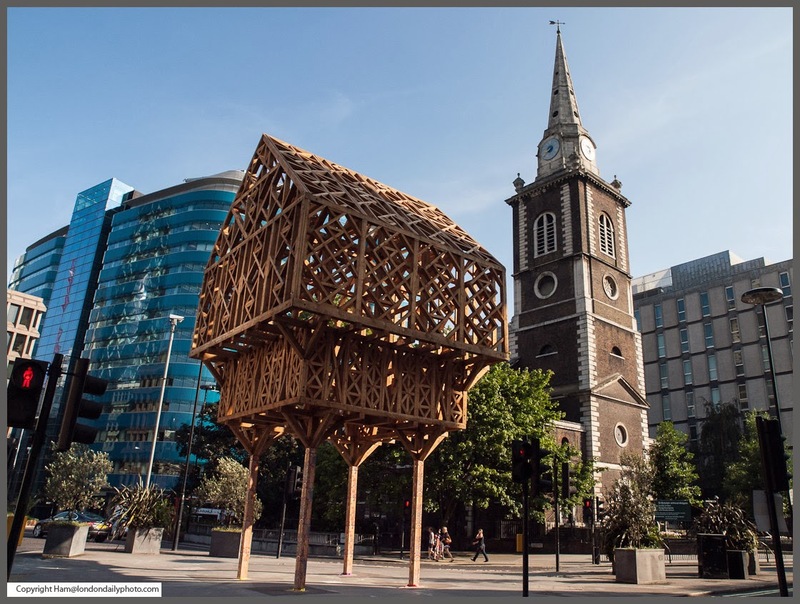 Do you know that ALDGATE Derives its name from one of the principal gates of the City-styled in the reign of King Edgar, Ealdgate, or Oldgate-under which passed one of the Roman roads leading into London ? Among the records of the City of London is a lease granting, in 1374, the whole of the dwelling-house above the gate of Aidgate to Geoffrey Chaucer, the poet, author of Canterbury Tales. Close to the old pump at Aidgate, at the junction of Leadenhall Street and Fenchurch Street, lived the indefatigable antiquary John Stow, whose name no historian can inscribe without feelings of reverence and gratitude. Walking through the area known as Psiri in the daytime is deceiving. Streets are filled with working class people and this former leather craftsman district contains a variety of shops and businesses that might be described as practical or business oriented. But starting at around 6 p.m. Psiri undergoes the transformation from working class light industrial, to a mecca of cafes, bars, restaurants and ouzeries. 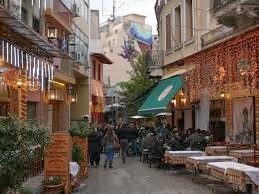 The mix of uses in this area of Athens is very successful. The streets are filled with tables and chairs, and what were parking lots during the day become dramatically lighted dining areas for restaurants at night. People live, work and entertain themselves within this area. It seems like a perfect place for a quick getaway from the bustle of the city. 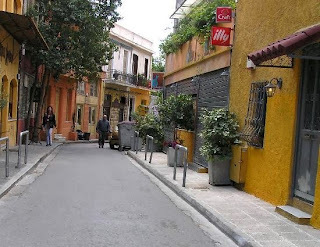 The easiest way to enter Psiri is from one of the small roads between the Attalos Hotel and Monistiraki Square on Athinas street. Besides these places there are numerous cafes and restaurants, and very few cars to bother you. There are also plans for the opening of many galleries and theaters in this district and the bordering former gasworks area, many of which have already opened their doors. 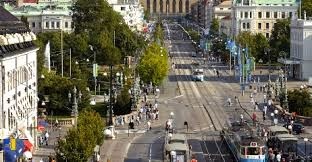 There is a chain of streets that are pedestrian-only, so it is very easy to walk from place to place. Be aware that when you enter Psiri, your first instinct will be to think "This can't be the place." The area seems dangerous and dark, but it is neither. It's patrolled by rent-a-cops who keep the Omonia Square riff-raff from making inroads into the area. As you follow the small streets towards the center it gets livelier and more well lit until suddenly you realize you are here. People use this space at all times of the day, for different reasons. They either work there during the day, or go out for a night of entertainment. There is a wide variety of places where people of different ages can actually go to. This area is for the explorer. Those who are tired of endless T-shirt shops and Mousaka signs, this is the place to go. This area is for people who want to see what it is like to be young and hip and hang out in Athens. Or even not so young and hip. This is a unique, significant district of Athens because of its history. 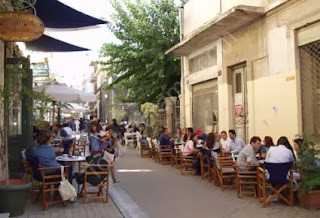 It is well known that the area of Psirri has created its own atmosphere, something that renders it unique among the other traditional neighborhoods of Athens. A lot of people are natives to Psirri, whereas there are others that have come to Psirri at a very young age in order to work or live. If you have children, there is an entire plateia (public square) to play in with plenty of kids from the neighborhood. St. Mark's Place is vibrant at all times of day. It teems with interesting stores, including numerous record stores and tattoo and piercing parlors. It also has a wide array of bars and eateries, catering to a very mixed crowd. The prime block of St. Mark's, between Second Avenue and Cooper Square, is full of people at all hours, while the beauty of the architecture is more noticeable on the eastern end of St. Mark's, which is quieter. St. Mark's has the ideal design for an urban street, it runs from one public square to another. At the west end is Cooper Square, where numerous streets converge, and teenagers can be found skateboarding and hanging out on any sunny day. There is also a subway station there. On the other end is Tompkins Square Park. Once blighted, it is now a well used and popular greenspace in the center of Alphabet City, New York's trendiest neighborhood. The westernmost block of St. Mark's can be so crowded as to create impediments to foot traffic, but it is not a street one would choose to walk down in a hurry. There are simply too many interesting things on display in store windows, and too many people with interesting body art, not to stop and take notice. St. Mark's is without question dominated by pedestrians rather than vehicles. It definitely makes a good first impression on anyone interested in streets with diverse urban life on display. Considering that it once had a very seedy reputation, it is reasonably clean, and the crowdedness and heavy police presence keep it safe. People sit at outdoor restaurant tables, on stoops and doorsteps or anywhere else that they can. Although originally designed as primarily residential, it is lined with old brownstones and tenement buildings, St. Mark's Place filled up over the years with businesses on the first and second floors of most buildings, especially between Cooper Square and Second Avenue. In the 1970’s it was the heart of New York's punk rock scene. 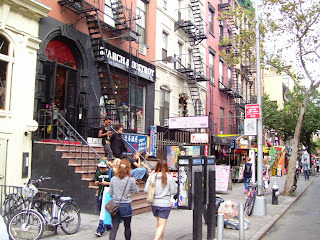 It has retained some of that image, but styles change, and the surrounding East Village neighborhood has gentrified. When the rock club Coney Island High closed a few years ago, a major part of St. Mark's Place went with it. Gentrification has also brought homogenization, a few years ago a GAP opened up on St. Mark's. But, while the heyday of its grittiness may be gone, St. Mark's remains a fun and fascinating destination street, and today it is much safer than it once was. Every evening groups gather on the corners of Devon Street, each of which is like a community gathering space for the people who live in this mostly South Asian neighborhood. 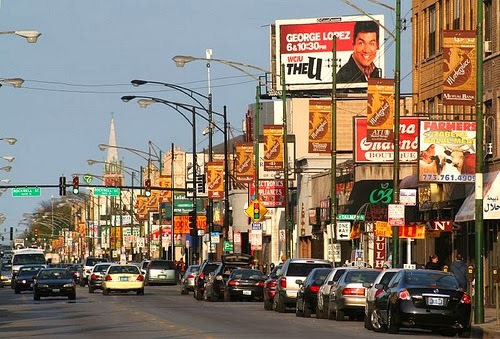 Chicagoans come from great distances to dine out at one of the many restaurants here, but the street has managed to retain its identity and strong social fabric rather than giving way to the pressures of gentrification. "We loved the wonderful quiet and comfortable quality of this ramblas. Its effect is one that immediately slows your pace, allowing you to observe the numerous people just relaxing and enjoying themselves (an activity at which the locals excel). 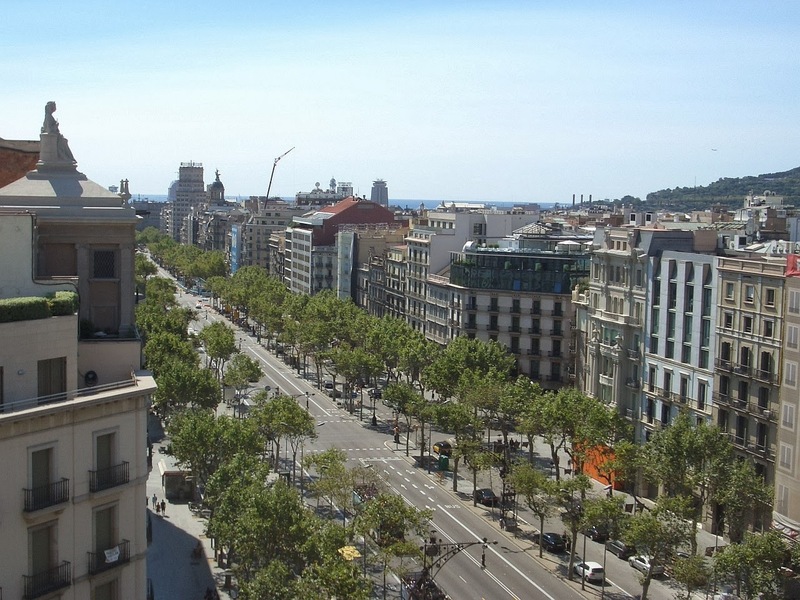 It also has glorious architectural bookends: the Sagrada Familia and the Hospital de la Santa Creu i de Sant Pau." 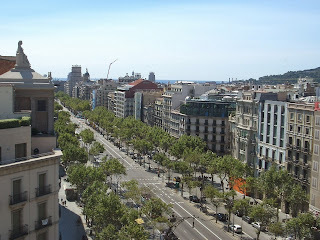 "This is easily a worthy contender with the Champs Elysee as one of the grandest boulevards of the world. 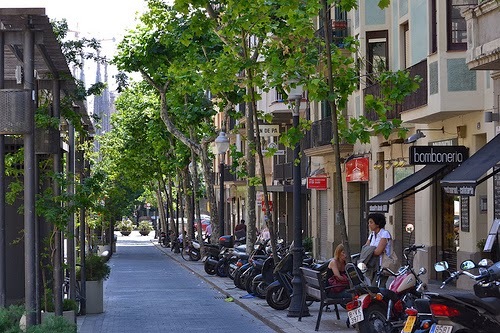 In fact, we prefer the Passeig as it is more restrained commercially, creating a nice balance among sidewalk, architecture and commercial activity. When originally built, it had narrow sidewalks with a side access road and a wide walkway for strolling (a primary activity at the time). With little access to the stores in buildings lining it, the boulevard struggled. Eventually the sidewalks were widened and the street took its current shape. At 180 feet, it is one of the widest of any city. But it is still comfortable, with an appropriate scale in relation to the size of the buildings flanking it. The extraordinary architecture along this street is one of its great attractions." A grand boulevard with neighborhood shops, a trolley corridor, bike lanes, parking drop-off areas, mid-sidewalk display cases, bike racks, benches, plantings, sidewalk paving, street trees, public art--every great city should have a street that works on as many levels as Kungsportsavenyn. Particularly remarkable are the ways different elements of Kungsportsavenyn have adapted over time. Passive historic facades have been made to engage the sidewalk with glass extensions and tents. The potentially street-deadening impacts of modern facades have likewise been mitigated, with café extensions for instance. Sidewalks are buffered from trolleys by benches, bike racks, and trees. The street's character changes about every two blocks, each transition serving a different purpose. It begins at the top of a hill surrounded by civic buildings and arts institutions. Next it becomes a boulevard with a center median bicycle greenway and smaller, neighborhood-scale businesses and shops. About two blocks later it becomes mainly a trolley street. And at the bottom of the hill, it opens up into an ornamental boulevard, leading to the entrance of the public garden on one side of the street, and opening out to the riverfront on the other side. 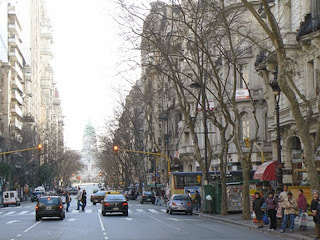 Avenida de Mayo is the central avenue in the city of Buenos Aires. The street connects the two main government buildings in the city, the Casa Rosada and Plaza de Mayo with the National Congress and Plaza Congreso. Both sides of the street are lined with tall, decorative buildings with wrought-iron balconies, grand entrances, ornamental columns and sculptures. This part of Buenos Aires is old, most of it built before the population exploded in the latter half of the twentieth century, and the buildings show their age. Some are crumbling and most are dirty from the air of the city. They are beautiful. The street is lined with majestic sycamores that filter the light and obscure the building facades, making their beauty a bit of a mystery. The sidewalks are full of people going to work, eating, and selling food or newspapers. Where the subway stations surface on the sidewalk from below, they have been designed with iron railings and signs consistent with the architecture of the buildings and are beautiful in their own right. They become a place to congregate and they blend in with the rest of the architecture. The street itself is large and busy: four lanes all going in one direction and full of taxis, cars, and buses belching fumes. It is unpleasant to cross for pedestrians but not impossible. Most people move up or down one side. 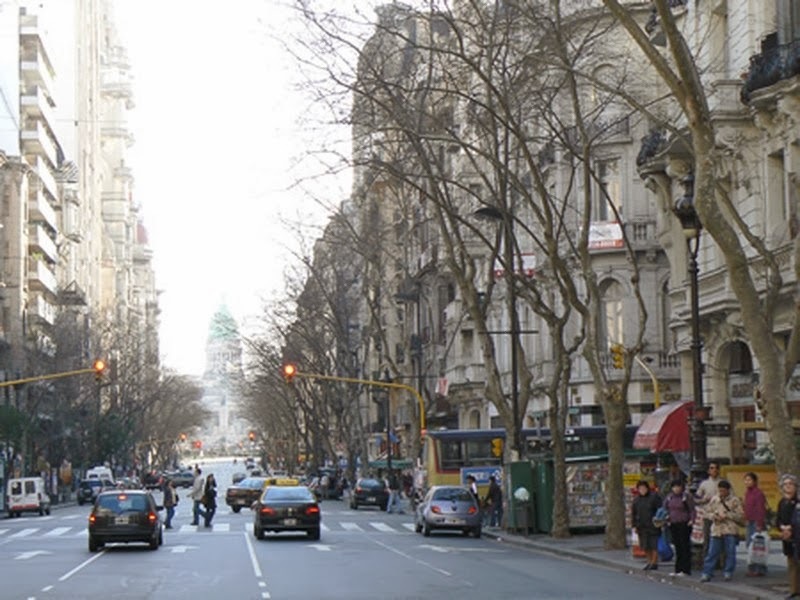 It is a good picture of Buenos Aires: a contradiction between the beautiful architecture, pleasant trees and people walking and the dirt, decay, and hectic pace of the Southern City. The street is full of loud and dirty cars and buses and as such it is a loud and dirty place itself. Nonetheless, the sidewalks are wide and comfortable, crosswalks work well at every intersection, and subway entrances and bus stops provide access to the rest of the city. Avenida de Mayo is impressive. Indeed, it is largely due to this street that that people come away with the impression that Buenos Aires is the “Paris of South America”. The French-style architecture and large, mature street trees create a comfortable and interesting setting for the life on the street level. 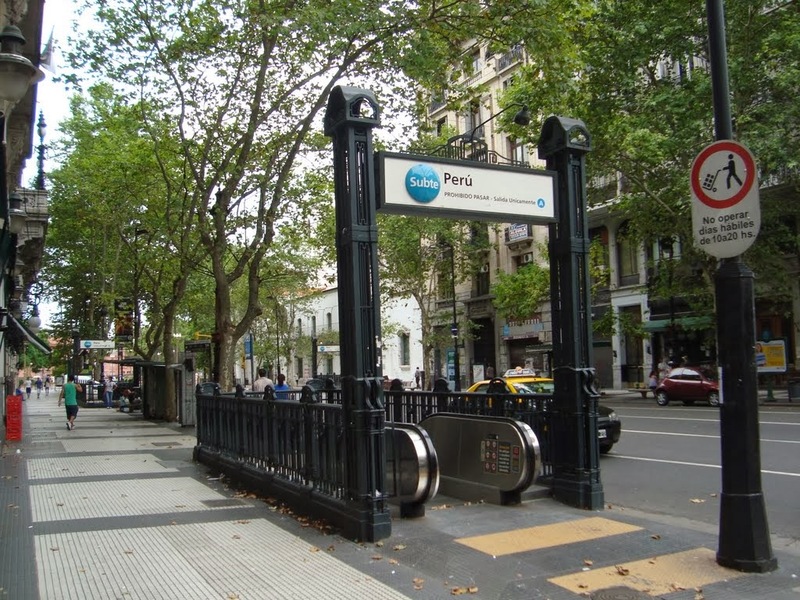 The street receives special treatment, such as the wrought-iron subway entrances, and it is well-maintained. The bus stops provide no seating, as is customary with bus stops in Buenos Aires. Neither are there seat walls or other opportunities to relax without being a patron at one of the many sidewalk cafes. Most people use Avenida de Mayo to move. It is not so much a destination as an experience in-transit. The sidewalks and roadway are full of people moving through the city. However, the street level bookstores and cafes along with an occasional cinema or other attraction do provide a destination point for people. Most people using the street are moving from one point to another in the city. Nonetheless, there are many conversations- people talking to the man running the local newspaper stand, people conversing over lunch or while having their shoes shined, people conducting business. There are also many people walking down the street on a mission, talking only to their cell phone or not at all. The most dominating sounds are that of the traffic. There are tourists and groups here, but the user population (cars and people) is in such a constant state of flux that they are absorbed.